How to choose the right Ski and Snowboard Boot Bags for your needs? Good ski and snowboard boot bags offer comfort and can accommodate all your skiing gear in an organized manner. With bags ranging from those specifically designed for carrying boots, those that double up as air travel bags, to those capable of warming up your boots before you hit the trail, there is definitely a wide variety to choose from. Ultimately, the best is relative because it all boils down to knowing your specific needs and going for the ski or snowboard bag that matches these needs. There are many features to bear in mind when selecting a bag for your boots but these important ones will put you in a good position to make an informed decision. Regardless of the size of your ski boots, most ski bags will fit most if not all boot sizes. The idea is to find a ski boot bag with enough room to fit your boots and all other items that you intend to carry along without squeezing them. Look for bags that have a durable material with protective layering or padding on the inside. Polyester or synthetic fibers are good options since they are not only tough but also water resistant. Bags made of high-quality fabrics will not only last longer, but they will also protect your gear well enough. While ski boot bags without padding will be good if you are traveling in a personal vehicle, you may need a padded bag for air travel because here, you will travel separately from your luggage. Secondly, check the zippers of the bag. Zippers on ski or snowboard boot bags are a factor you should never overlook because they directly affect the security of your items. Confirm if the zippers hold tightly and can withstand constant pressure due to usage. If you are headed to destinations with overly wet conditions, check that zippers are waterproof or water repellent. There are different bag designs with different carrying styles. Some you will carry as a backpack, others come with carrying handles, while others can be carried both ways. Others come in an isosceles design, others like Dakine’s Boot Locker boot bag feature the split level design. Along these lines, check how easy it is to access specific items without interfering with the entire gear. There are far too many designs to choose from only make sure it is what works for you. Secondly, these bags need to be soft enough to protect your gear from abrasion and tough enough to keep you going for years to come. Some of the best snowboard boot bags are designed to accommodate one or two pairs of boots. Still, they come in the same size as the others, everything depending on how well you will pack your items. Be sure to check the size of your boots against the dimensions of the bag you intend to purchase. Ski boot bags may have several sections or one large compartment. The only downside of having a bag with one chamber is losing some smaller ski items inside the bag. Many compartments, on the other hand, help you to remain organized while allowing you quick easy access to your items. Some bags come with pockets on the exterior, others with webbings and slings for suspending some gear on the exterior of the bag to save up some space. Depending on the weather, you may have to pack ski boots when wet. That is why ski boot bags come with drainage discs. The vents will allow snow and water to drain away. However, you may need to go a step further to sprinkle some shoe powder to keep your boots dry and free from mold and bacteria. Most ski boots fail the airline requirements for carry-on luggage. They cannot fit under the seats or in overhead compartments. Make sure you confirm with your travel agent about the specifications and the type of shoes one can carry in flight. Well, it may seem as if colors do not matter much but they do. Bright colors, for instance, enhance visibility while dark colors on a ski boot bag conceal dirt. Again, a color that’s different from that of your peers makes identification easy. Our review analyzes 9 top boot bags with admirable features. Here is what makes them tick. The Kulkea’s Powder trekker has been designed to accommodate boots, helmet, and other gear. 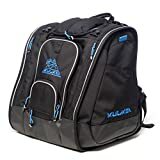 This ski boot bag is by far very well compartmentalized, allowing you to organize all your gear in a neat convenient manner with the 15-inch high boot compartments located at either side of the bag. Other gear should fit well in the central roomy compartment an arrangement that creates a balance in weight when the bag is packed. This makes it easy to carry around since weight is evenly distributed. This bag is generally lightweight thanks to the fact that it is made of long-lasting fabrics including nylon, tarpaulin, and polyester which are all water-resistant and lightweight. The interior is further divided into smaller compartments for smaller ski gears and each has a zipper. The 52-liter bag will accommodate boots of up to 28.5 Mondo size. Athalon’s Everything boot bag is literally that, a bag for all your gear including your jacket, helmet, boots, and other items you may want to carry to your skiing destination. This 58.5-liter bag features numerous dedicated pockets allowing you to organize your gear in the most convenient way. These include side pockets with zip closures and enough ventilation to keep boots up to men’s size 13, a roomy compartment at the center for other gear, and an easy-access MP3 pocket with a port to secure your headphone. It is also outfitted with clips from which you can suspend your keys or gloves. This bag is made of durable polyester fabric with a waterproof treatment to prevent your gear from getting wet. In addition, it features a PVC waterproof base and grommets at the bottom to drain water away from the bag. The padding on the straps and the four lumbar back pads are not just important for comfort and support, they also act as a reinforcement that will prevent fast wear and tear. Finally, handles at the top and front let you carry this bag in different styles and the brightly colored piping enhances visibility. The Athletico Ski Boot Bag is an excellent option for storing the rugged boots for skiing and snowboarding during your travel. 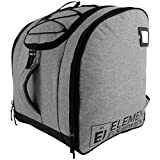 Measuring 18 x 15 x 15 inches (h x l x w), this bag has ample space to pack your jackets, helmets, other ski gear, and accessories. At its sides are zippered compartments for each of your boots and at the center, a spacious section for all your gear. In addition, it comes with a bungee cord at the front, which you can use to hang your goggles, gloves, or even jacket if you happen to take it off while on the trail, a headphone port, and an MP3 pocket at the front. 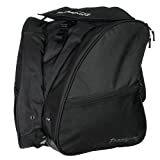 This bag offers excellent support with paddings at the straps and the lumbar back area along with discs at the side and bottom of the bag, which provide ventilation and drain out snow. It has a carry handle conveniently located at the top. The back straps are detachable and can be stored in the zippered section right below the carry handle. The most outstanding feature on this ski boot bag is its fleece-lined goggle pocket which is functional for keeping your goggle lenses free from scratches. Designed with ample space in mind, this 17-inches tall bag will carry boots up to size 14 men’s at the sides with all your gear in the compartment at the middle. Enjoy more comfort by carrying the bag on your back with padded back straps along with full padding at the back and bottom to cushion your spine and laps whichever way you will be carrying it. This bag is tough. It is made of 600 D polyester fabric with waterproof PVC backing and a lined interior to create double protection for your gear, especially in very wet conditions. It is also a highly versatile option thanks to the detachable back straps and top carry handle. Thule’s RoundTrip is an amazing boot bag made of premium durable fiber. It has a generous 60-liter volume capacity to accommodate your boots and all your gear. Unlike other boot bags, the boots compartment is located at the rear of the bag. This section has grommets useful for ventilation and for draining away snow and water. It has dual access to the main compartment, at the top and front, making it easy to access the items you need without disorganizing the rest of the gear. The back panel flips open and flat to double up as a step-on mat when you need to change shoes and the exterior straps can be attached with any of Thule’s Roundtrip ski or snowboard bags into one luggage for a hassle-free trip. Versatility doesn’t end here. This bag comes integrated with lash webbings which you can use to secure your ski poles, boards, helmet, and other objects on the outside. The more fragile objects like goggles, sunglasses, and mobile phones will be safer in the crushproof SafeZone compartment at the top of the bag. 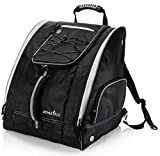 This bag also has two extra pockets on either side for keeping quick-access items and its slender upright construction makes it easy to go through doors with ease. It is also pretty comfortable with ample padding on the back straps, back panel, and carry handle. Purchase lockable zippers along with it for added security. 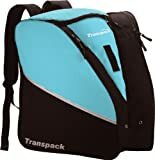 When you need a comfortable weight on your shoulders, then the Transpack Edge Ski Boot Bag makes a good option. This bag comes with soft paddings on the adjusting abrasion-resistant neoprene shoulder straps for extra comfort. It comes in an isosceles design such that when your boots are packed on the side compartments, the space left at the middle takes the shape of an isosceles triangle. Well, it is roomy, but you will need some creativity to pack your gear in a way that all of them fit. It also has an additional zippered interior pocket at the top where you can keep quick-access items. All pockets have dual lock zippers which make it easy for you to access the items of your bag from any point. This bag is tough. Made of 600 D polyester with PVC backing, this bag does not only offer you some useful years of service, but will also effectively prevent water from penetrating into your gear. Overall, this is bag is lightweight and hardwearing. On the con, however, this bag can only be used as a backpack since its straps are neither detachable nor concealable. 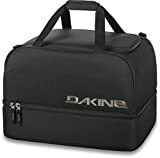 Dakine’s Boot Locker bag a.k.a double-decker is made from waterproof 600 D polyester and features a split level design with the boot section at the lower tarp-lined compartment and the gear section on the upper compartment. The tarp-lined section opens up flat to double up as a step-on mat when changing wearing or taking off boots. The additional zippered pocket at the top helps you keep your quick-access items safely and conveniently. This bag is designed with two carry handles but also has a padded shoulder strap included in case you need to carry it differently. The Boot Locker bag has an impressively large 69-liter capacity, enough for all your gear. On the con, however, this bag lacks grommets so you may need to shake off snow from your boots before packing them inside the bag. Still, the fact that boots are kept in a separate bottom compartment, is a guarantee that no moisture will get through to your gear. 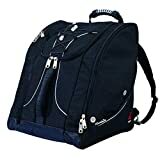 The bag is available in a range of colors to meet your taste and overall, it is well built. The Boot Trekker is built with a large 69-liter capacity to fit all your gear. Made of a combination of 1680D, 840D, and 420 D nylon along with 210 D polyester and tarpaulin base with grommets for drainage, this bag comes as an incredibly strong heavy-duty option. It features high-level organization with numerous pockets for literally every gear that you’ll carry. The ventilated boot pockets at the size fit up to boot mondo size 31, a roomy main section which opens at the top, along with a front compartmentalized pocket for quick-access items. If you wish to save up some space, make use of the sling at the back of the bag to suspend your helmet. This bag is expandable in width from 18 inches to 19.5 inches making it pretty flexible. This bag comes with an adjustable padded waist strap to ease the weight on the back straps and still secure the bag firmly to your body for easy travel. The XT1 Ski Boot Bag is best suited for an all-around traveler who will not mind the isosceles design. The bag is padded at the back panel, at the shoulders straps, and at the chest, straps to maximize user comfort. 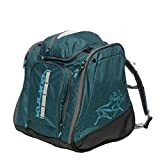 This bag comes with side boot compartments with extra meshed pockets on the outside functional ventilation and extra storage purposes and drainage grommets. Its main compartment is accessible from the top and is backed to prevent water and moisture from penetrating into your gear. This boot bag is tough enough, made of backed 600 D polyester fabric. It is designed in a range of colors giving you an option to select your favorite color. These are just nine of our best ski and snowboard boot bags to choose from for the best traveling, skiing, or snowboarding experience. They are spacious, well constructed, comfortable, and durable. Ultimately, your best choice will be determined by your immediate need. Consider the material a bag is made of. Is it versatile? Do you have different carrying options? Can you use it as a carry-bag in a plane? All these are questions you need to ask before your purchase.